Machine Labels - Ready To Apply Glass Graphics. Make your best impression in the field. We offer ready-to-apply (RTA) graphics, made to order. Glass Graphics - Any large-format graphic that applies directly to the glass (or see-through substrate) protecting (or promoting) food items displayed for purchase. Common examples include vending machines, cafeteria sneeze guards, and facility entry points (doors and windows). Machine Wraps - Any large-format graphic that applies directly to the outer casing of a physical point-of-purchase display or device used for promotional purposes. 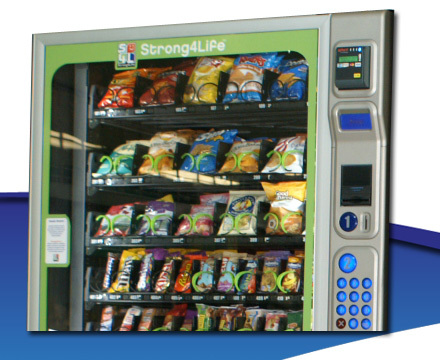 Common examples include advertising on the sides of vending machines to advertising on fleet vehicles. Mark your territory! Vending Machines have an outer perimeter area on the glass that can be used for graphics without interfering with the view of the food products. Utilize these areas by adding graphics that match the customer's logo (or your own), and even promote specialty programs. Vending Machine front glass graphic, branded to PMS® colors. 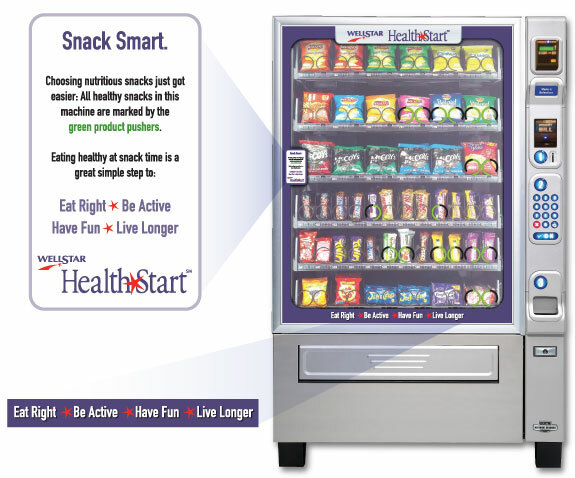 This example explains that healthy snack food items are marked by color-coded product-pushers. Do not cut corners when it comes to advertising. Most businesses have to pay a premium for choice property: meaning high-traffic, high-impression locations. With your existing equipment, you already have the means in place, so take advantage! 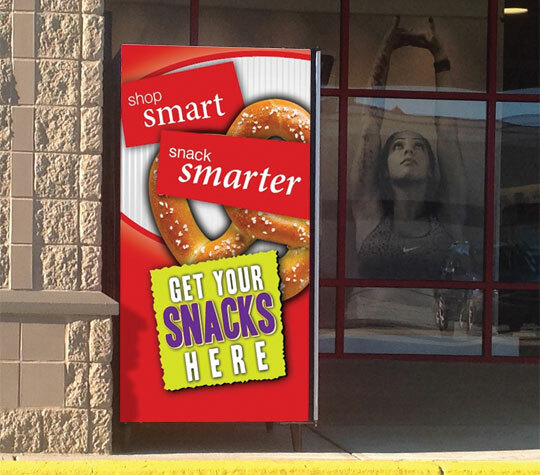 Side View of Vending Machine Wrap in full-color digital vinyl. This example uses a PMS® color scheme (red) to match the roofing and window molding. Use our full-service Design Team and in-house production technologies to promote your business on your vehicle fleet. Promoting your business with vehicle graphics is still the most cost-effective means to get the most impressions of your branding in your area. Full-Color Digital Vehicle Wrap. Select the image for larger view. Contact our Graphics Team by selecting the Contact Us - Graphics Division button to the right. Our online form takes only a few minutes to complete. This will allow us to best address your graphical needs. The Multiple Media Network includes graphic artists, production artisans, and fabrication specialist. Our Team works hand-in-hand throughout each stage of every project. This ensures our high-quality results. By grouping projects nationally - raw material costs, (maximizing material usage), we are able to offer high-end, yet cost-effective results. Our Graphics Team is often asked to produce "specialty" design projects for a variety of purposes. In short - if you need to look good, you need The Multiple Media Network. We welcome any challenge. Glass Graphics and Machine Wraps can serve multiple purposes - to both streamline and better advertise your business.